I’m a big list writer, I need them to keep me on track. My kids in particular are sensational at hijacking my day. I find if I write a list for the next day, I can hit the ground running and avoid being railroaded into doing things for my children, that the really need to be doing for themselves. It’s a bit like when I learnt how to parachute. The instructors train you over a weekend until you are so brainwashed by the necessary positions etc. you have to adopt for the jump and landing, that you go into automatic pilot (pun intended) You don’t allow the fear and the instinctual reaction: “What the bloody hell do you think you’re doing, climbing out onto the wing of a perfectly good plane and jumping away from it?” to kick in. My lists are somewhat the same, they act as a directive from my functional self. I obey the next thing on the list, ring here, book that, pay the other, without engaging my fears, doubts and perfectionist streak. I do what I planned to do, instead of wasting hours researching the best way to proceed, or worse still, doing a million pointless jobs around the house, that I suddenly feel have to be done! I like to do lists as I go along through the day, as things occur to me. It clears my head in the moment, so they don’t keep nagging at me and at the end of the day I revise and priories them. By doing this I can be sure that I have put the most important and pressing issues first and gotten rid of any items that are no longer a concern. My work lists tend to be pretty dull, pen on paper lists, but being a visual person I make other list-like creations! Collages with various long term goals I want to achieve, mind maps written and drawn in different colours with arrows and various lettering sizes and shapes, all interconnecting across a page. These prettier versions can be stuck up around the house to constantly reinforce and remind you of your priorities and desires. Remember, they don’t have to be all work related and I strongly suggest they’re not. Live spherically! Who wants to be rich, but unwell, or healthy, but lonely and joyless? Create a balanced visual goal or have different “lists” for different aspects of your life. Ha, I just had an image of a feature wall with all my schemes and dreams plastered all over it! Possibly a little full on for the family! 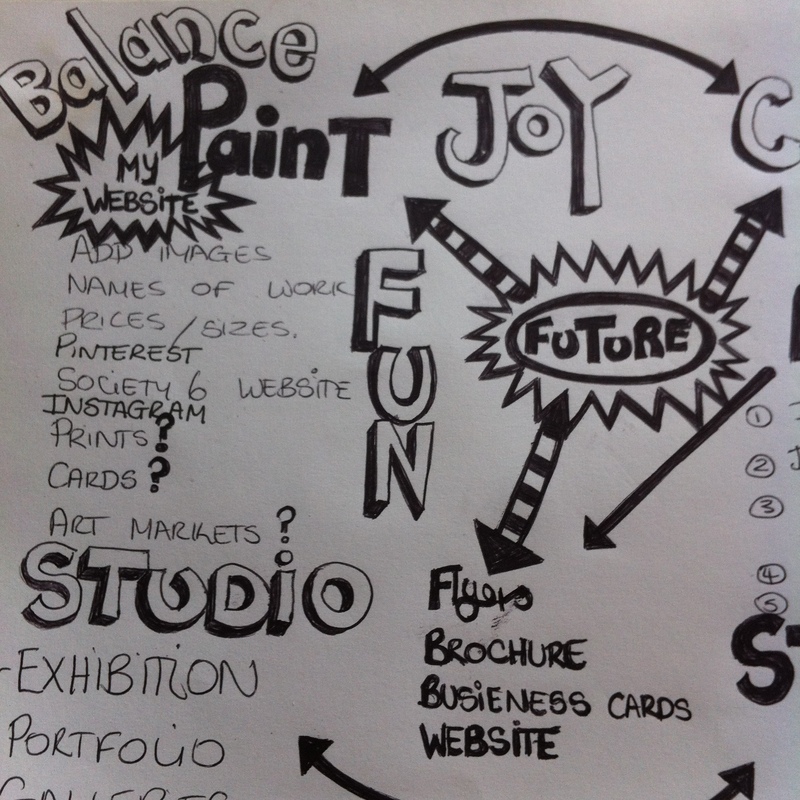 I must admit, I’ve set myself a daunting list of goals for my art practice this year! The first thing I want to do, when the kids return to school ( Yay!!!!) is break my goals down into less overwhelming chunks. I also suggest getting really specific. Nebulous goals tend to float around taunting you and confusing the universe. I’ve found repeatedly in my life, that if I take the time to really focus on what I want to achieve and define the steps, amounts and time frames, that the universe seems to supercharge the whole thing! Suddenly the perfect people, places and opportunities appear from nowhere. Serendipitous conversations, revelations and an often effortless flow occurs. Mind you, it’s not all taken care of by universal energies, you still have to put in the work and follow through, but there is something wonderful about feeling the universal energy is partnering and approving of your venture and assisting your actions. I think we’ve all had that feeling, when things just feel right and seem to happen with a lot less effort than usual. Setting goals like this is just a way to invite more of this to happen in your life. It’s definitely different from just thinking lists. You know the ones I mean, they drive you crazy at 2am, but can’t even be recalled with any clarity as you drag yourself out of bed at 6 or 7am! Mental lists tend to go round and round in your head, take up too much nervous energy and are rarely of any help at all. 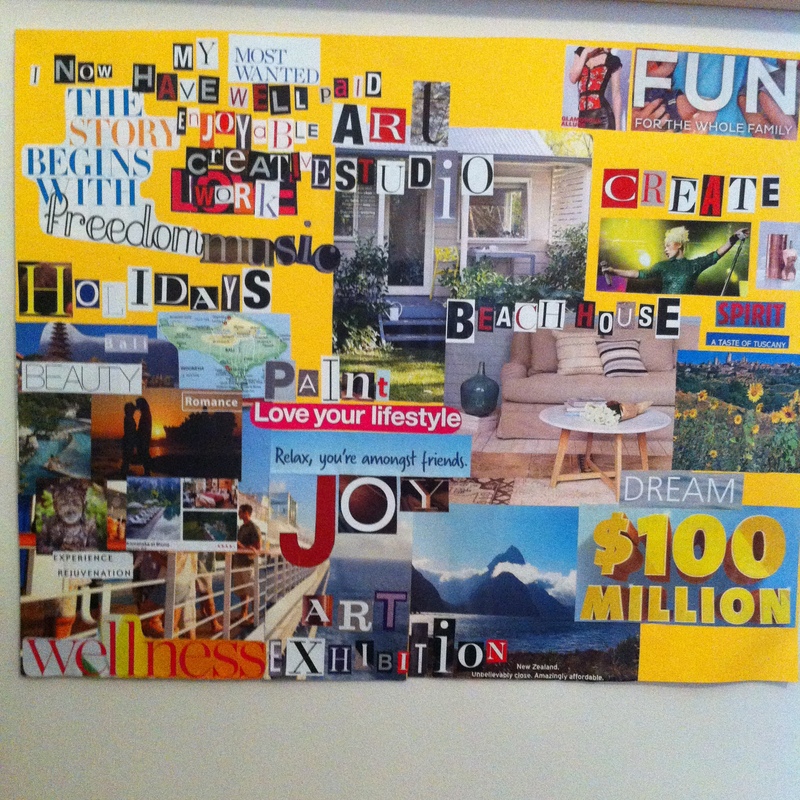 Writing, drawing, collaging it down, clears your head and makes what you want real. The dreams, schemes and ideas suddenly have a form and begin to take on a life of their own. My suggestion to you is give it a go. I know it works for me and I love to share things that work for me with other people. It’s not a new concept, I hardly invented this idea, but like lots of good ideas, we tend to forget about them. Consider this a timely reminder, a nudge from a friend to pick a goal, big or small. Break it down into do-able steps and make sure that you are really specific. Create a list, collage, mind map or all three! Then start working toward your goal, little steps at a time, 20 minutes a day, if that’s all you have. It’s amazing what can be achieved one thing at a time. 20 minutes writing a day, can write a book in a year! 20 minutes creating something you love each day will fill an exhibition, a market stall, your home with beautiful handmade one offs. I’d love to hear if you have any breakthroughs, or if you been using these techniques for years and what you have achieved with their help. This is spot on. Years ago I did this exact thing as a dream scheme and so much of what I dared to place both in a folder and on cardboard has come into fruition. It is said that your dreams can’t come true until you have visualized them and dared to put them out there. Mind mapping has been another wonderful tool I have even used within departmental planning. It works really well. Love this blog cos I it’s got such validity. Thank you! I really appreciate the encouragement!